DUBAI, UAE - May 26, 2017 - PRLog -- Whether you are looking for staycation, vacation or desert trip, log on to Adventure Emirates' newly launched online reservation portal that gives instant booking confirmation for travel experiences in UAE. Developed by Adventure Emirates, specialists in holiday planning, the website serves as an informative portal for tourists seeking better understanding of the UAE without the digital clutter. Designed using modern technology, this reservation software also features book now, pay later facility making the process flawless and less daunting. The system is also an informative travel resource with all available tools at a click of a button. Determined to be at the forefront of industry's technology, Adventure Emirates seamless booking process is convenient and efficient with immediate booking verification and a 24-hours online support to ensure speedy assistance. Through the site, Adventure Emirates delivers stress-free options of over 300 tried and tested excursions including half-day and full-day sightseeing, safaris, boat tours as well as water activities like kayaking and jet ski in Abu Dhabi, Dubai and Ras Al Khaimah. Trips across Fujairah, Umm Al Quwain, Ajman and Sharjah will soon be online thus encouraging tourists to discover all the seven emirates. Specialized team of local experts allows Adventure Emirates to cater to different group sizes plus corporate, meetings and incentives requirements. With Adventure Emirates, discover familiar landmarks, uncover hidden escapes and explore attractions, culture and the people of the UAE one emirate at a time. "Our easy to navigate online booking system allows an accessible site with varied experiences to view, book and buy almost immediately. With prompt confirmation, the service accommodates last minute reservation as well as options to create tailor-made packages, all within an easy click of a button. As travel trends continue to evolve, customers will demand experiences that explore true spirit and cultural understanding of a destination. We deliver those through our expert tour guides in every emirate, thus delivering an honest essence of the destination. Integrated with a team of expert operators, we continue to enhance travel packages while ensuring first class services and presenting the best of the UAE" said Dhevandrea Hikaru, Founder, Adventure Emirates. Through comprehensive experiences, Adventure Emirates aims to educate visitors about the culture, history and heritage of the UAE. Committed to deliver high standards of service, Adventure Emirates curated experiences are complimented with top-notch customer care, qualified tour guides, quality vehicles, and attention to detail. Adventure Emirates online booking system continues to gain momentum amongst local, regional and international tourists in search of prompt service and unmatchable expertise. The company offers nationwide tailored packages as well as comprehensive recommendations for corporate groups, meetings and incentives packages. 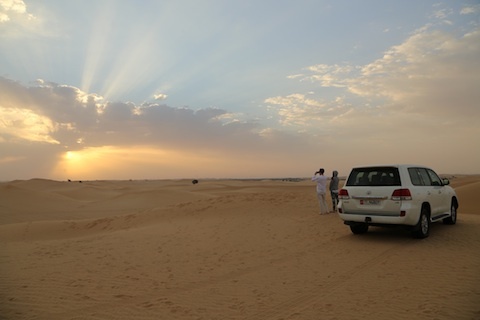 Experience the UAE like never before, visit www.adventureemirates.com and discover the nomadic lifestyle of desert Bedouins contradicted by the modern wonders of the cosmopolitan UAE.